Dimensions: 970mm (W) x 100m (D) x 370mm (H). Suitable for ponds up to 72,000 Litres (approx). Universal 2" and 63mm solvent weld inlet and outlet ports. Supplied with a 5 metre cable. 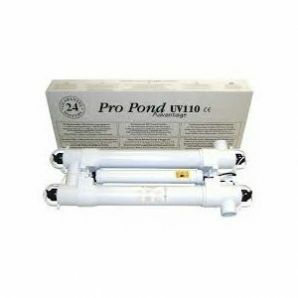 This TMC ProPond clarifier is designed for larger ponds, incorporating pressure filters or pressure circuits such as sand filters and venturis.It has fused quartz glass sleeves which ensure that germicidal lamps are able to reach their optimum 'burn temperature' where the highest amount of UVC radiation is emitted.